We get lots of visitors "just passing through" on various migrations. This little guy has been here a few days and decided to weather the snow storm here. We keep our bird feeders filled and offer as much as we can to the birds coming through. We have lots of trees, which is fairly rare around here as it is usually very dry. Because of that we are rewarded with lots of bird friends. We encourage them to tell their friends. Deeply saturated blues and exceptional framing make this stand out. Nice. Pleasingly cheerful. 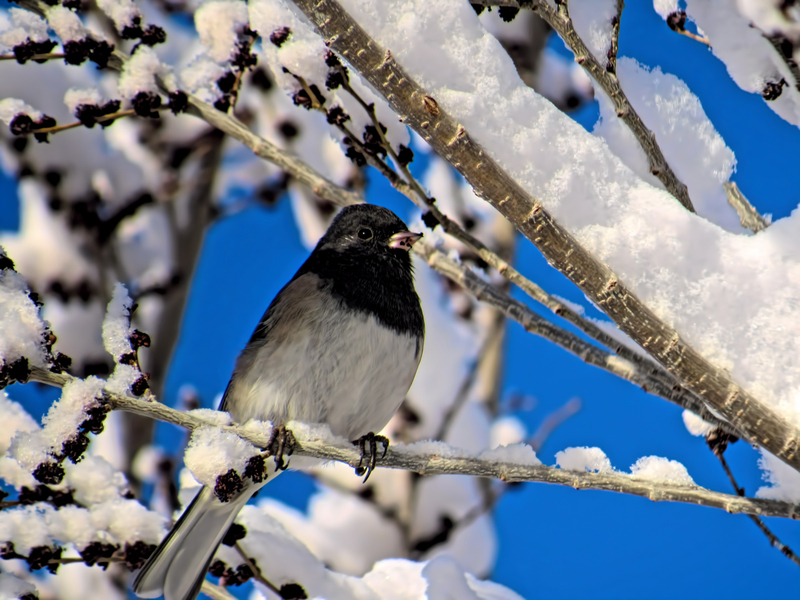 The bird's colors harmonize nicely with the snowy tree and the blue sky. This is a little gem. Love it when the snow builds up on the branches. I think he likes the berries on that tree. Audubon-like image, simply beautiful. lovely that you have a haven for the birds .. and its not even strange that you would say that you encourage them to tell their friends ..
when i put out seed its like they do tell each other .. firstly a couple of rosellas might come by and have a feed .. before long there will be a few cockatoos and then the king parrots .. its amazing their communication .. almost beyond our understanding ... well mine anyway .. Proudly hosted by Sargasso Networks. Current Server Time: 04/23/2019 06:38:00 PM EDT.